Dr Paul Kersey is an experienced trauma surgeon, a man who has spent his life saving lives. After an attack on his family, Paul embarks on his own mission for justice. 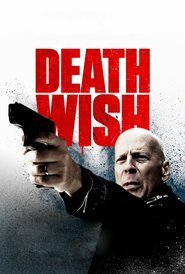 Bruce Willis is tired and his acting is terrible — almost cringe-worthy at times — in this remake. The plot is predictable and clichéd. And the worst thing about the movie is its promotion of vigilantism — something we don’t need with the ongoing mass shootings in America. At times, it feels as though the NRA in the US has backed the movie with its focus on guns and getting vengeance because the police don’t do a good enough job. There’s one scene in a gun store that comes across as satirical. It’s hard to know whether it was intended that way because nothing else in the movie has the same feel. If the movie had been directed as a satire, it may have had some redeeming quality. As it is, it is not worth watching.